William Smith O'Brien was an Irish Nationalist and Member of Parliament (MP) and leader of the Young Ireland movement. He also encouraged the use of the Irish language. He was convicted of sedition for his part in the Young Irelander Rebellion of 1848, but his sentence of death was commuted to deportation to Van Diemen's Land. In 1854, he was released on the condition of exile from Ireland, and he lived in Brussels for two years. In 1856 O'Brien was pardoned and returned to Ireland, but he was never active again in politics. Or an obituary in the Sydney Morning Herald in 1864. O'Brien became a member of Daniel O'Connell's Catholic Association but disliked O'Connell's threat to the political interests of the local Clare gentry class. He and O'Connell also disagreed over Irish poor law, tithe reform, the repeal of the corn laws, and non-denominational education reform. After O'Connell was imprisoned for sedition in 1843, O'Brien joined the Repeal Association and acted as leader in O'Connell's absence. This brought him into contact with a group of younger men led by Thomas Davis and associated with the Nation newspaper. A dispute arose over Young Ireland's support for Robert Peel's proposal for three non-denominational university colleges. Young Ireland also disliked O'Connell's conciliatory moves towards Lord John Russell's new Whig government. Matters came to a head when in August 1846 Thomas Meagher attacked O'Connell's non-violent approach and O'Brien led a split between Young Ireland and the Repeal Association. The following year O'Brien became leader of Young Ireland's Irish Confederation. When the government ordered the arrest of several prominent Young Irelanders including Charles Gavan Duffy and suspended habeas corpus O'Brien attempted to initiate a rebellion. Enthusiasm was muted and on 29 July 1848 he and several others besieged Widow McCormack's house, outside Ballingarry in county Tipperary where police had taken her children hostage. O'Brien was arrested on 7 August and in October 1848 he was sentenced to death for high treason. This was later commuted to transportation for life to Van Dieman's Land. On arrival, he was sent to Maria Island, to the probation station at Darlington, where he was given a cottage to live in. That one there, with the open door and the sign out the front. So it's time to go home. I think it's a sign of good day when you're happy to head back to the ferry, but with a last lingering look behind. Now I am going to finish this tonight, no matter how long it gets. You've been warned. I want to get through these because I am getting am way behind in my evil, top secret plan to "document" as many towns as I can! But shh, don't tell anyone, OK? Sections in italics are from the Parks and Wildlife Visitors Guide. This is a long post, but I wanted to get to a good stopping point in the narrative. So, if you can remember back to last time, we were up on the hill. Now, we go down. And see if there is anything at the bottom. OK I know there's someting, because I have a brochure that says there is. Somewhere. So around and up the hill. The first stop is the brick barn. 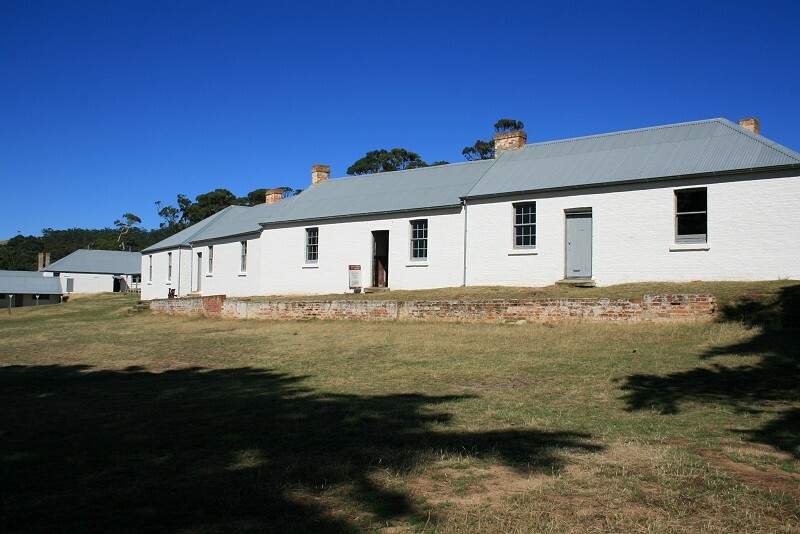 This building was constructed [in 1846] by convicts using bricks made from clay puddled with sea water. Look at the way some of the bricks are disintegrating. The salts from the water have crystallised and weakened the bricks. When I hear of people who set stories in places where they've never been I always think that no matter how much you read about a place, it's never going to be quite what you expected. Which is really a good thing, or by bother travelling? You could just look at places on web sites. The trip over on the ferry took about 40 minutes. We saw no seals, dolphins, southern right whales (with or without their calves) and even fairy penguins. The latter were offered as the consolation animal: if we see nothing else, there'll be the penguin. Long 40 minutes. The water was so smooth it looked like a blue glass floor lifting and rising. The first recognisable building as we approached the island was this little cottage out on its own on the hill. "What was that for?" "I don't know."